EN8 turns easily with HSS tools. However, the first thing to do was to put a really good edge on the tool, for this I use a diamond pad. The before (left) and after images of using a diamond pad. 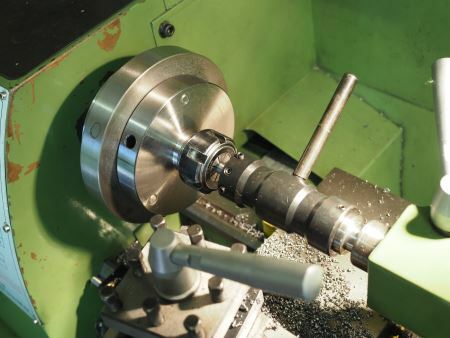 The machining of the EN8 was all done using the Warco WM240B with a speed set around 600rpm. I use a machining fluid that I can apply with a brush. 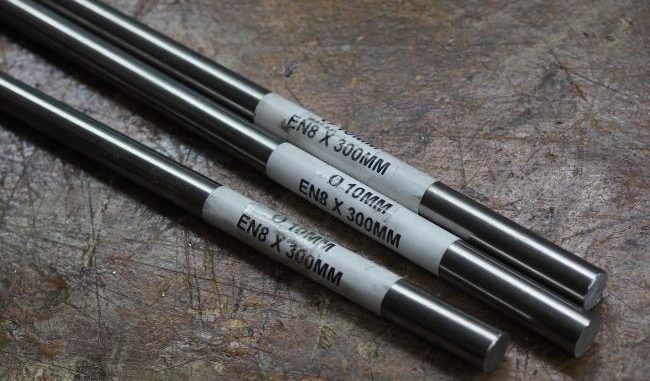 The machining of the EN8 was rather easy and not that different to using EN1A. This wider image shows a better view of the setup in the lathe and the fact that I’m using an ER25 collet chuck. For this type of round stock this gives a much more readily repeatable on centre location of the steel in the chuck. I started the threading using a tailstock die-holder. This ensures the die is aligned and gives a fantastic straight thread. I did only just start with a few turns of the thread before moving to a normal die holder to finish the thread in a vice. 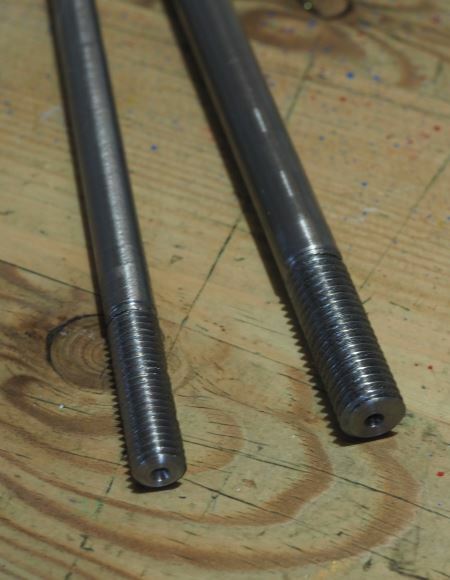 The final machined bolts. The thread of the bolts are clean and straight. Overall, EN8 is easy to machine, slightly tougher than EN1A (mild steel). HSS tools work fine with angles as per normal EN1A work fine. I use a cutting oil from Warco that I can apply with a brush and that doesn’t rust the lathe bed – less cleaning and re-oiling of the lathe every time I use it. EN8 is more expensive and I could only find it in sizes down to 10mm in diameter.